DAYTONA BEACH, Fla. – The fireball across the way flashed into the dark night causing their heads to jerk up and take notice. Inside the race control room, high above Daytona International Speedway, a group of NASCAR and track officials stared out in shock, awe and horror. The Daytona 500 was on fire. "You can't print what got said," Robin Pemberton, NASCAR's vice president of competition said. "It was just in unison, 'Holy whatever.' "
Juan Pablo Montoya's rear suspension had just failed during the yellow flagged lap 160 of last year's Daytona 500, causing him to skid into a jet dryer that was innocently clearing debris from the famed track. The result was a massive explosion before Montoya's car even slid down into the grass. The sport's signature race, already moved for the first time in 54 years to prime-time Monday due to inclement weather, was now dealing with the most improbable of situations. "I have hit a lot of things, but a jet dryer?" Montoya would say that night. "[As I skidded to it] I was thinking, 'This is going to be on fire pretty bad.' "
He was correct about that. Montoya was able to stagger out of his disintegrated car, his helmet burned from the explosion. 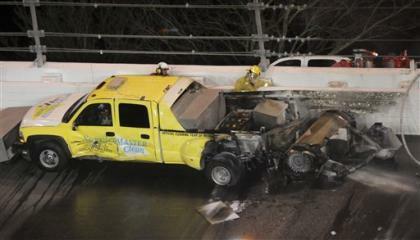 A rescue worker sprinted by him toward the jet dryer, where Duane Barnes, the driver, needed help out of the truck. At that point, it was spewing jet fuel onto the high banking of Turn 3, but the track itself had not caught on fire. Meanwhile in race control, with a camera zooming in on the truck, everyone was shouting at once. 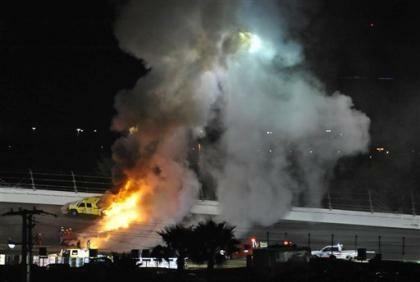 "[NASCAR president] Mike Helton and I were both looking at the camera, yelling, 'Get the fire crew there, dispatch them, send them, send them,' " Joie Chitwood, president of the Speedway said. "Normally you wait until there is a fire, but we knew the fuel leaking down the track was going to light up, our world was [about] to get lit up. This is the story of how Daytona International Speedway and NASCAR managed to somehow put out a 200-gallon jet-fuel fire, save the track, re-bond the surface, obey all Environmental Protection Agency regulations, entertain a growing national television audience during a nearly two-hour delay, finish the race after perhaps the most bizarre moment in its storied history and eventually have its stressed-out executives avoid any heart attacks. "Where did they get all that Tide detergent?" Danica Patrick asked. "That's what I want to know." The first goal was assuring the safety of Montoya and Barnes. They were transported together to the infield medical center and were later deemed fine. The second goal was to save the track, which was more complicated than just putting out the fire. It was imperative to keep the track as cool as possible in an effort to prevent it from melting under the intense heat. So even if the truck kept burning, that wasn't the biggest concern. "There is a plan for everything, even a plan for this," Pemberton said. "A lot of people didn't understand at the time, but we knew there was a finite amount of fuel that was going to come out of there. "We had water going on the asphalt," he continued. "People criticized us saying why didn't you try to put the fire out more? But for us, it would've taken longer to put the fire out on the vehicle when we needed to cool the asphalt." Once the fire stopped, there was a huge mess. Fuel everywhere, soft asphalt, chemical materials. "Fuel on a race track is bad," Chitwood said. "If you let fuel sit on asphalt by itself for a while it will turn asphalt into mush. Burning fuel is even worse." It needed to be scrubbed, cleaned, scooped up and inspected to see if the race was salvageable. That's when many watching at home – the ratings on Fox actually spiked during the fire because, well, who doesn't like watching a jet-fuel fire? 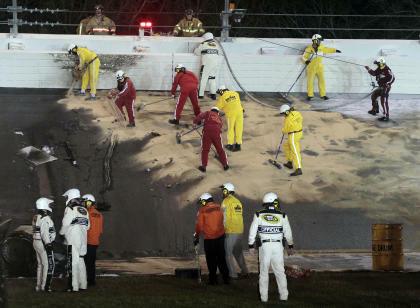 – wondered why they didn't just blow the whole mess into the infield? That wasn't an option, Chitwood said. "That's a contaminated material, so we have to account for that," he said. "You can't just blow that into the grass. You have to put that into barrels, you've got to take storage of that. It has to be transported appropriately." Indeed on the Tuesday following the race, EPA officials showed up for an unannounced inspection at the track. The first thing was a check of the infield lake for an oil sheen that would give away an illegal dumping. There was none, and after going through the barrels of debris the agency eventually praised DIS as a "model company." The next day the federal Occupational Safety and Health Administration (OHSA) arrived and did their own inquiry. The track was praised for the safety of the response, also. Environmental and worker safety concerns were just part of the challenge, one that was being done under the pressure of time. "It's prime-time TV," Chitwood said, "so NASCAR officials kept asking me, 'How long, how long, how long?' I kept saying 'Don't know, don't know, don't know.' We have a plan but we've never done this in practice because you'd never set the track on fire." On the back straightaway, drivers, halted by a red flag, began getting out of their cars and tried to pass the time. At first they were confused. "You looked down and saw these big, billowing flames it was like, 'Oh, geez," Patrick said. A few attempted to walk down and see the fire up close, just for the fun of it, but were turned back. "I can't believe they didn't let us go take a look at it," Dale Earnhardt Jr. complained. About the only driver with a clear view of the situation was Jimmie Johnson, who was knocked out of the race earlier in a major wreck. Rather than stick around the track, he went directly to Daytona International Airport, which sits parallel to the backstretch of the speedway. As his private plane took off toward his North Carolina home, he looked out the window and saw the fire raging. "We could see a fireball and I was like, 'This can't be good,' " Johnson recalled. With no idea what happened, he feared for the safety of his fellow drivers. He assumed it was a huge pile-up, since the idea of a dryer getting lit up was impossible to conceptualize. "Once we got up to altitude I told my pilot you have to find out what happened," Johnson said. When he received word, he shook his head in disbelief. The delay at Daytona was so long that Johnson was able to make it home and watch the end of the race on television while lying in bed. Back on the track, Brad Keselowski began tweeting pictures from the driver's point of view, which the Fox broadcast, eager to fill time with anything, hyped up. Keslowski gained 135,000 followers in a matter of an hour, a valuable social media spike that helped convince NASCAR officials to not fine him for having a cell phone in his car. Meanwhile in Turn 3, the Speedway's chief engineer and "asphalt guru," Bill Braniff, was crouching over the track, poking it with a pencil to gauge the firmness. He got on his radio and called back to Chitwood. "We might be OK," Braniff said. With that, the operation shifted into a second phase, getting the track back ready to race. Which meant out came the Tide. Lots and lots of Tide. Nothing is better at separating fuel from asphalt than regular old powder laundry detergent. Tracks use it not just for massive leaks like this, but in maintenance after every race. NASCAR requires every track to have plenty of it available for races. So television viewers were treated to visions of track workers frantically opening industrial size boxes of Tide detergent and sweeping and scrubbing it all over the place. The absurdity of the scene just added to the entertainment and led many to ask Patrick's question. Where do you get all that detergent? "A typical store," Chitwood said. "I don't know where we got it but we always buy an entire pallet of it; we have a pallet sitting out there now, too." Suddenly the most brand-conscious sport in America was giving incredible exposure to Tide, which ironically discontinued a sponsorship deal with NASCAR a few years back. In a postrace media conference, Helton refused to call it by name, referring to it merely as generic "laundry detergent." "It doesn't matter what brand you use," Chitwood said. "We probably just got the best deal on Tide. That brand got very lucky. It was just a coincidence." NASCAR wouldn't mind if Tide, or any other company, wanted to be named the official jet-fuel clean-up detergent of the sport, but in the end they use what works. "You can't let that stand in the way of something you need that does a good job," Pemberton conceded. Once the detergent did its trick – and hosing off created plenty of soap bubbles – the track was dried. Then workers applied a bond to firm up the surface. Then the bond needed to be dried and checked. It was a process, one step at a time, with everyone just focused on the task at hand and not thinking about whether it would be successful in the end. "We don't approach things like that," Pemberton said. "We never say that because you work through things and tackle each small thing and then make the decision later." About an hour and forty-five minutes after a jet-fuel fire sent flames 20-feet into the Daytona night air, officials stood over the once-scorched track and declared it repaired. Or at least they hoped. The truth is, no one knew for sure. "For us, it's like fingers crossed, toes crossed," Chitwood said. The race went to yellow and the cars began rolling through Turn 3. The drivers reported things felt fine, maybe a bit soft, but good enough for racing. So what the heck, this is NASCAR after all, they re-started the race. One hundred miles later Matt Kenseth edged out Earnhardt for the victory. Everyone back up in race control finally exhaled. "One of the things we learn in this industry is you can only kid when you say, 'Well, I've seen it all now,' because it's not true," Pemberton said. "There are things out there that you have no idea where they are going to come from and the recipe required to make them." If anything, inside NASCAR the accomplishment wasn't celebrated as much as it should have. This is a culture so built on ingenuity and MacGyver-like fixes that this almost felt routine. "One thing with our sport, common sense is everywhere," a smiling Jimmie Johnson said. "Not a lot of book smarts, but we have common sense covered." Nearly a year later, almost everyone can joke about it and discuss the moment with pride. They planned for the unplannable and the plan worked. In the end, it was quite a memorable and highly enjoyable Great American Race. "Well, we put on a show," Chitwood said. "We did put on a show. And I hope we never have to do it again."